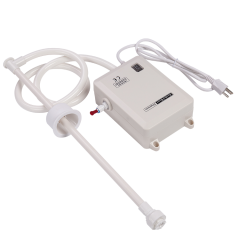 Flojet 5 gallon bottled water dispenser pump Great for Coffee Carts, Shows & Events, Demonstrations, Temporary Installation, Difficult Plumbing Access. STARFLO bottled water system for portable water supplies can be utilised for coffee/tea machines, water dispensers, refrigerators, ice makers, and other applications using portable water supplies. 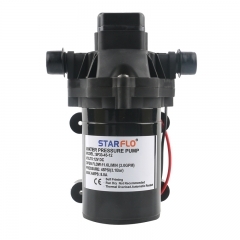 The STARFLO system is also designed for convenience - the pump shuts off when the water source is depleted, and when water is restored it automatically restarts. 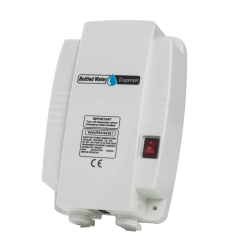 This eliminates the chance of any damage to the pump and control box from running dry. FEATURES - Illuminated On/Off switch provides clear visibility in dark cabinets or hard to reach places - Long life motor ensures years of reliable operation - Quick disconnect port allows for easy wand replacement in seconds - Flojet diaphragm pump provides dependable run dry capabilities, extending the life of the pump - Quiet operation - the system is equipped with noise dampening rubber feet to minimise noise pollution - Thermal protection prevents overheating, protecting the pump and control box from damage - New ergonomic T-shaped wand handle allows for ease of installation and removal of wand from bottle - 20 foot (6.1metre) discharge hose is included - Built-in check valve prevents back flow TECHNICAL DATA If need more technical specification for the pump, pls send email to us ! 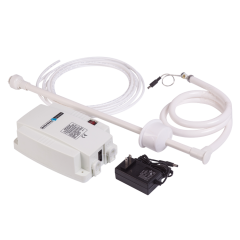 Flojet Bottled Water Dispenser For Coffee Maker Or Refrigerator Connector PRODUCT DESCRIPTION STARFLO BW4003A is the new design compare with BW1000A,BW2000A, BW3000A and BW2020A. The difference among them is the different voltage, For BW 40003A, the voltage is 110V AC -240V AC. Pump recipe-quality water from commercial bottles to ensure better-tasting hot and cold beverages. The Bottled Water System is designed to work with coffee/tea makers, refrigerator ice and water dispensers, espresso carts and portable sinks or any use requiring portable potable water.The Bottled Water System is also designed for convenience.The pump automatically shuts off when the water source is depleted and restarts when water is restored. Its compact size supports easy mounting. THE DISPENSER INCLUDE: Suction wand and hose assembly. Pump module with On/Off switch. 6 foot cord with plug. 20 feet of 1/4" discharge tube Universal seal cap: Fits any 3, 5, and 6 gallon plastic water bottle. Installation and maintenance instructions. FEATURES Illuminated On/Off Switch Provides clear visibility in dark cabinets or hard to reach places Long Life Motor Ensures years of reliable operation. 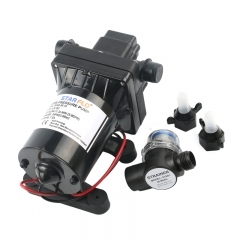 STARFLO Diaphragm Pump Provides dependable run dry capabilities, extending the life of the pump. Quick Disconnect Ports Allows for easy wand replacement in seconds. Quiet Operation Equipped with noise dampening rubber feet to minimize noise pollution. 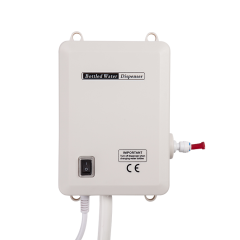 Thermal Protection Prevents overheating, protecting the pump and control box from damage. TECHNICAL DATA Model Voltage Flow Rate Pressure Amps Inlet Outlet Dimensions G.W BW4003A 110-240 VAC 3.81LPM 40psi 0.5A 6" 3/4" 27*60*10CM 3.3KG Sample order is very welcome to have a test, if need more technical specification, pls send email to us ! 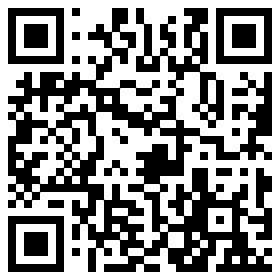 Ssubscribe to our newsletter to receive news,updates, and special offers by email. Copyright © 2015-2019 Xiamen Starflo Industry and Trade Co., Ltd.